Hey High 5-ers, did you know today is National Dog Day? 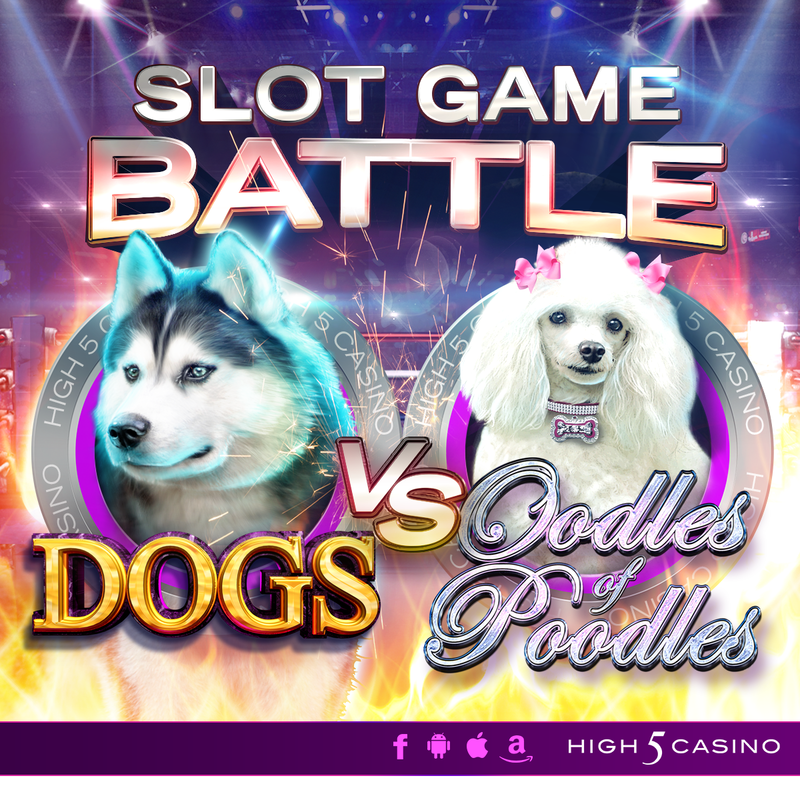 We can’t think of a better way to celebrate man’s best friend than by featuring some of our favorite pooches in this week’s Slot Game Battle. High 5 Casino has a number of pooch-filled games including Dogs, Oodles of Poodles and Pawesome. Everyone knows dogs are man’s best friend and picture this, you just found out you are going to be getting a dog! You’re not getting any average dog though, you get to pick out a dog from one of H5C’s dog slots! You can choose a husky from Dogs or a poodle from Oodles of Poodles! They’re both so cute and you want to pick out the one that’s best for you, but how do you choose? Don’t worry we’re here to help! Dogs are a man’s best friend for a reason. When you get home after a long day, they’re the first ones to greet you. When you’re feeling happy, they’re ready to play and when you’re in the dumps, they’re around to offer comfort and unconditional support. Loyal, loving, and protective, a dog will never let you down. If you’re a person who would like a companion for the outdoors, a husky may be a good fit for you. Huskies are an intelligent breed who thrive on human companionship. They love running, playing, digging, swimming, and they even enjoy hanging around other humans! In the winter, you’ll find your husky frolicking through the snow or just laying around basking in the cool air. In the summer, you can find them digging in your yard looking for a place to cool down. If you like running or sledding, laying around or being in the outdoors, a husky may just be the perfect dog for you! Now poodles, they’re freaking adorable! The best part is they come in all different sizes and colors. White, black, cream, apricot, brown—standard poodles to teacup poodles, you’ll definitely be able to find the perfect one for you! Oodles of Poodles show toy poodles strutting their cuteness. With their dainty features and fluffy fur, you can’t help but want to squeeze them! Toy poodles are the ultimate companion dogs, they enjoy cuddling up next to their owner. They also enjoy playing with toys and being involved in every aspect of your life. Standing on average 10 inches tall and weighing 5 to 10 pounds, you can easily put them in your purse or take them for a ride! Trips in the car, walks on the beach, walks to the park, and even those late night trips to the ice cream stand, a toy poodle can always be by your side! The time is here, you have just arrived to pick up your new dog! The decision has been a tough one, but you finally made your choice! Comment in the conversation bubble located on the top right corner of your screen and let us know if you chose a husky from Dogs or a poodle from Oodles of Poodles! This entry was posted in game preview, High 5 Casino, High 5 Fight Club, High 5 Games, High 5 Moments and tagged Android, App Store, Apple, Dogs, Facebook, Free Games, Furr babies, Furr-tastic, game preview, Game Spotlight, Google Play Store, High 5 Casino, High 5 Casino Mobile, High 5 Games, Huskies, Husky, iOS, iPad, iPads, iPhone, iPhones, Mans Best Friend, mobile gaming, National Dog Day, Oodles of Poodles, Poodles, Shake the Sky Casino, Shake the Sky Casino Mobile, slots, social gaming by hoothigh5. Bookmark the permalink. You have a game Pawsome locked. what do I need to do to unlock it? Hey Sandra you can unlock Pawesome on your computer with an Unlock Any Game Reward or by purchasing it for $1.00! I chose the West Highland White Terrier from new game “Pawsome”!